IT’S GOLD-TONE, ROUND SHAPED, AND IS MARKED CORO. 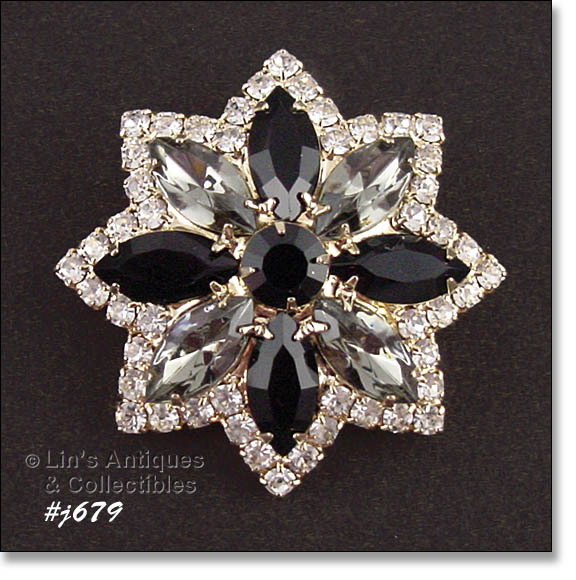 PIN HAS MARQUISE AND ROUND CLEAR RHINESTONES WITH LOTS OF SPARKLE. IT MEASURES 1 3/4” DIAMETER. 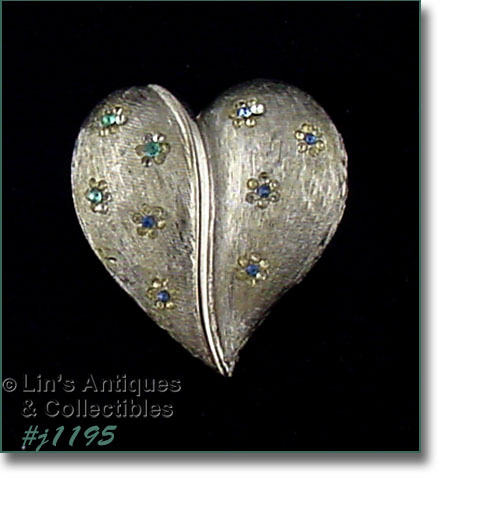 IT’S HEART SHAPED, SILVER-TONE, AND IS MARKED BSK. 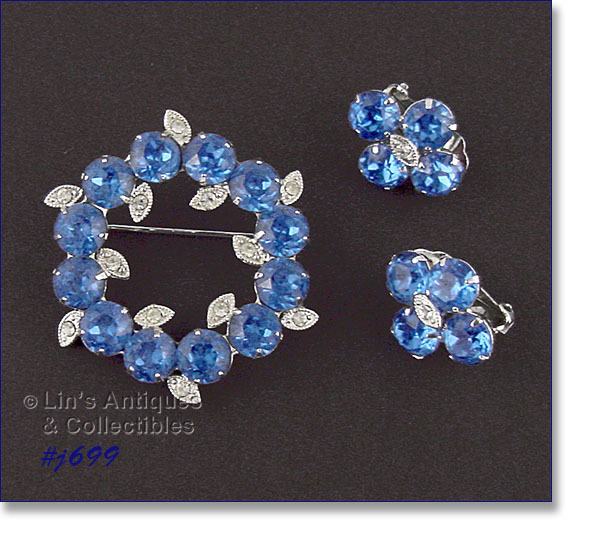 PIN HAS LITTLE RHINESTONE FLOWERS – BLUE CENTER RHINESTONE SURROUNDED WITH CIRCLE OF CLEAR RHINESTONES – A NICE DETAIL! IT’S SILVER-TONE, MEASURES 1 3/4" DIAMETER, AND IS MARKED WARNER. 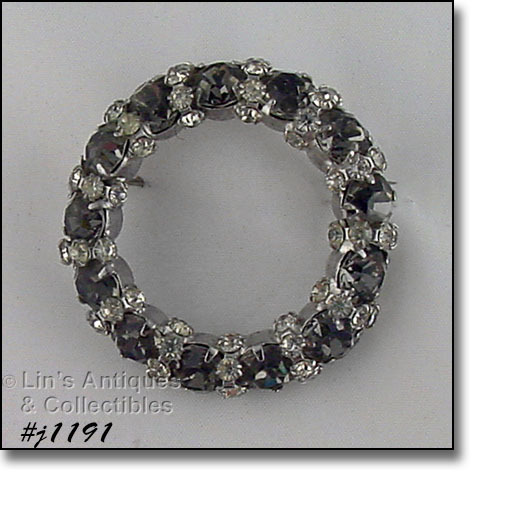 BROOCH HAS ROUND LIGHT GRAY COLOR RHINESTONES WITH EACH BEING SEPARATED BY A ROW OF 4 SMALL CLEAR RHINESTONES. ALL ARE PRONG-SET. 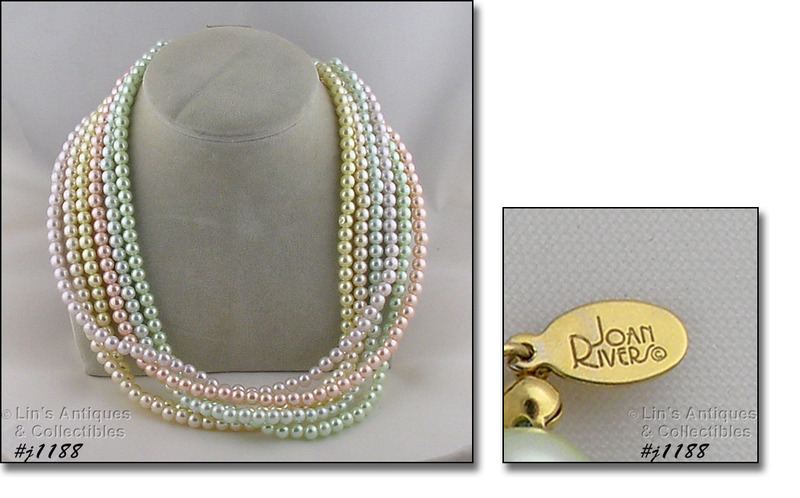 IT’S A MULTI-STRAND PASTEL COLOR FAUX PEARLS NECKLACE THAT MEASURES 19 1/2” IN LENGTH. IT HAS A GOLD-TONE LOBSTER CLAW CLASP AND A GOLD-TONE OVAL MARKED JOAN RIVERS. IT’S “ANTIQUED” GOLD COLOR AND IS SHAPED LIKE A STEM WITH LEAVES. THE LEAVES ARE COVERED WITH PASTE-SET CLEAR RHINESTONES. THERE ARE 4 ROUND SHAPED CLEAR RHINESTONES THAT ARE PRONG-SET. 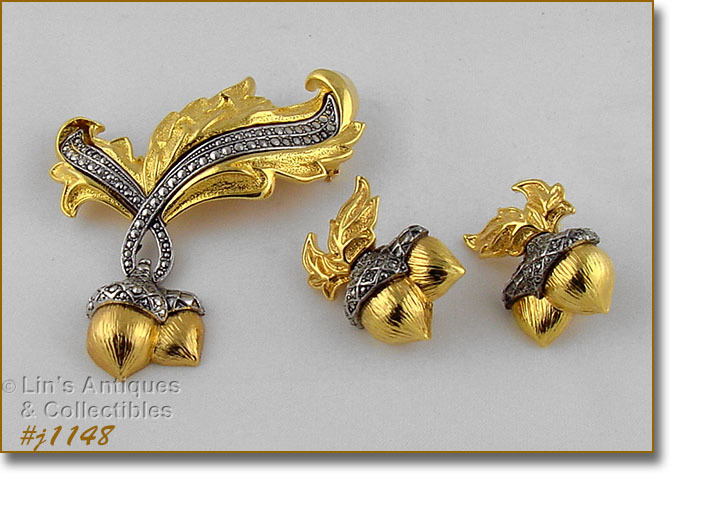 THEY’RE GOLD-TONE WITH FAUX MARCASITES AND ARE LEAF SHAPED WITH ACORN DANGLES. THE BROOCH MEASURES 3” X 3 1/4” (AT LONGEST AND WIDEST). 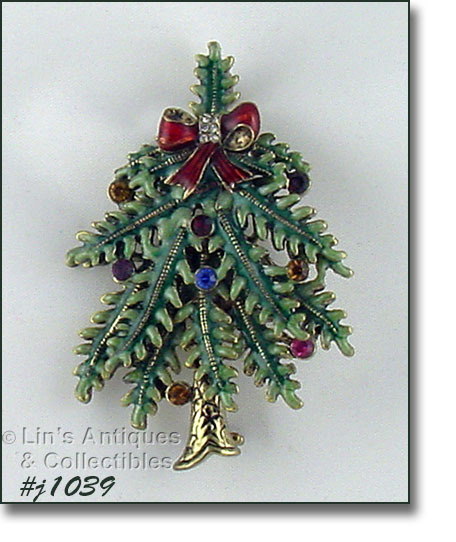 AVON BEGAN ISSUING AN ANNUAL CHRISTMAS TREE PIN IN 2004 – THIS IS ONE OF THOSE PINS! IT MEASURES 2 1/4” X 1 1/2" AND BACK IS MARKED: AVON, 2004, 1ST ANNUAL. 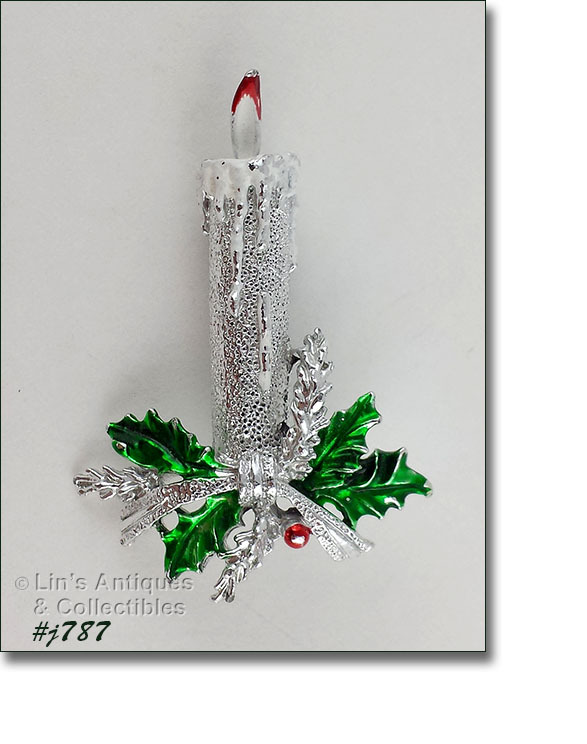 THIS IS NOT ONLY A COLLECTIBLE AVON AND CHRISTMAS TREE PIN – IT’S VERY PRETTY! BEAUTIFUL CROWN PIN BY B. DAVID! PIN MEASURES 2” X 1 ½”, BACK IS MARKED B. DAVID, RHINESTONES AND FAUX PEARLS ARE PRONG-SET, AND IT’S IN EXCELLENT CONDITION. THIS LISTING ACTUALLY HAS 2 B. DAVID SETS! ORIGINAL TO THE BOX IS THE BEAUTIFUL PENDANT WITH MATCHING EARRINGS. 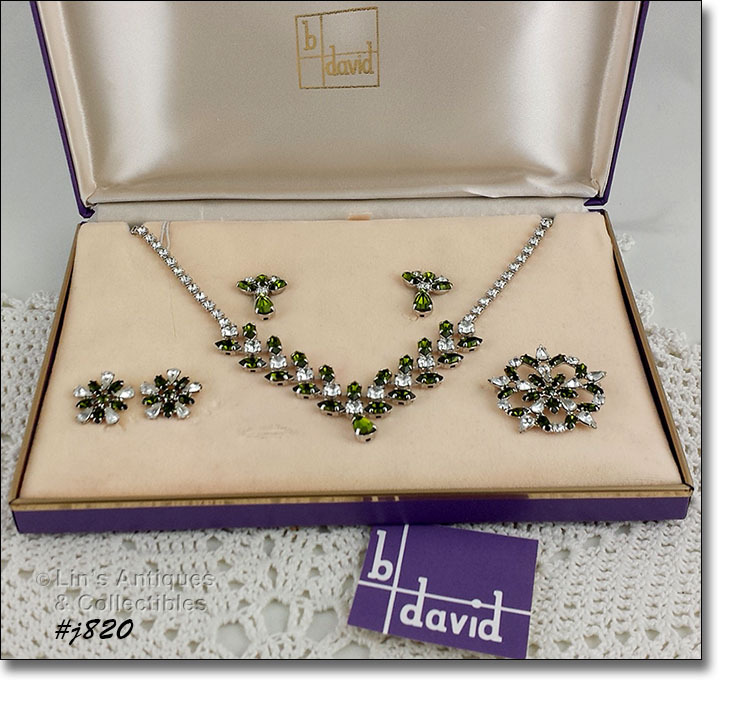 THE NECKLACE MEASURES 18 ¾” END TO END, EARRINGS ARE 1” X 5/8”, AND ALL ARE MARKED B. DAVID. 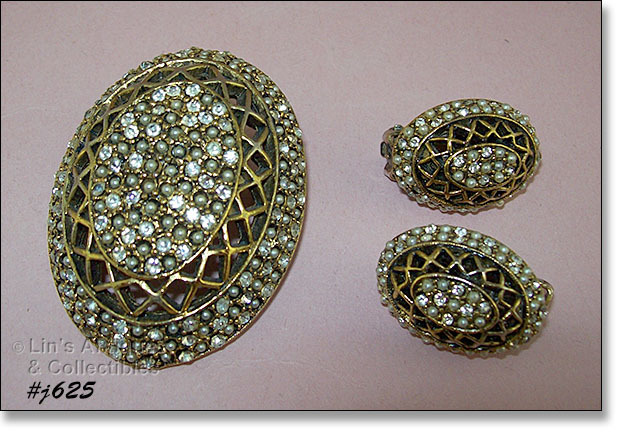 PRIOR OWNER ADDED THE EQUALLY BEAUTIFUL ROUND BROOCH AND MATCHING EARRINGS BECAUSE THE RHINESTONES MATCH THE PENDANT SET! THE BROOCH MEASURES 1 ¼” DIAMETER AND EARRINGS ARE ¾”. THE EARRINGS ARE MARKED B.DAVID. I DID NOT SEE MARKING ON THE BROOCH -- COULD HAVE OVERLOOKED IT – BUT ANYONE FAMILIAR WITH B.DAVID JEWELRY WOULD HAVE NO DOUBT OF ITS PRODUCTION. BOTH PAIRS OF EARRINGS ARE CLIP BACK STYLE. THESE ARE ABSOLUTELY BEAUTIFUL JEWELRY ITEMS! THIS UNUSUAL PIN HAS BEEN A PART OF MY PERSONAL VINTAGE JEWELRY COLLECTION FOR YEARS! THE BOX IS DARK RED COLOR WITH A HEART PIERCED WITH AN ARROW AND THE CENTER HAS THE WORDS “HEART THROB”. 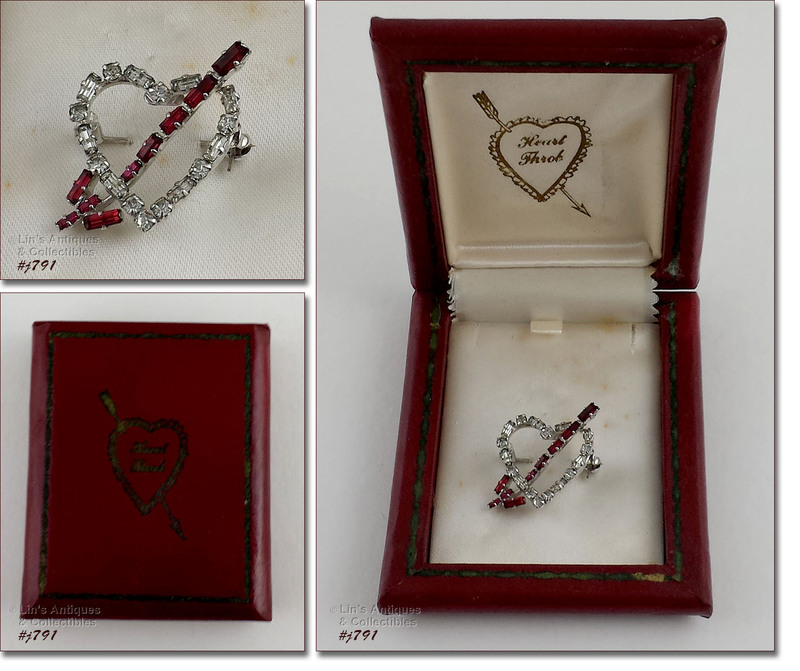 THE PIN IS HEART SHAPED CLEAR RHINESTONES “PIERCED” WITH AN ARROW OF RED RHINESTONES. PIN MEASURES ¾” WIDE (AT WIDEST) AND 1” LONG (AT LONGEST). THE ARROW IS 1 3/8” LONG. BACK OF PIN IS MARKED “MADE IN AUSTRIA”. 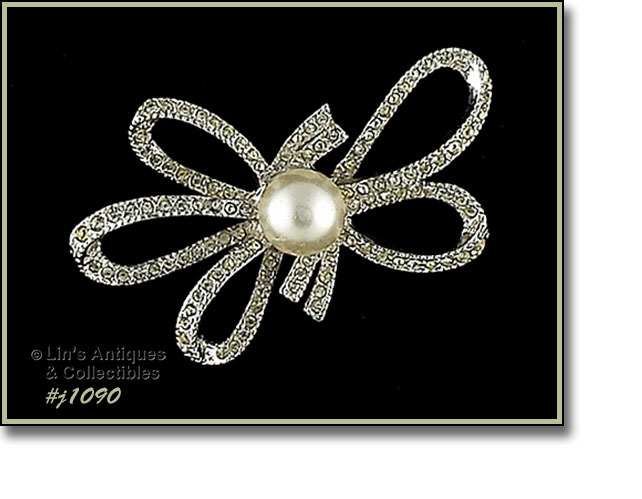 THIS IS A GORGEOUS PIECE OF VINTAGE JEWELRY AND WOULD BE AN EXCELLENT GIFT FOR THAT SPECIAL SOMEONE! I’M ALSO INCLUDING A STRETCH BRACELET WITH SLIGHTLY DARKER RED RHINESTONES TO ACCESSORIZE THE NECKLACE (BRACELET IS UNMARKED). THERE IS NO CHARGE FOR THE BRACELET AND IF YOU DO NOT WANT IT INCLUDED WITH NECKLACE JUST LET ME KNOW. THIS IS A REALLY PRETTY HOLIDAY PIN! IT’S A CANDLE WITH HOLIDAY GREENERY AT THE BOTTOM. PIN MEASURES 2 1/8” X 1 ½” AND IS MARKED GERRYS. 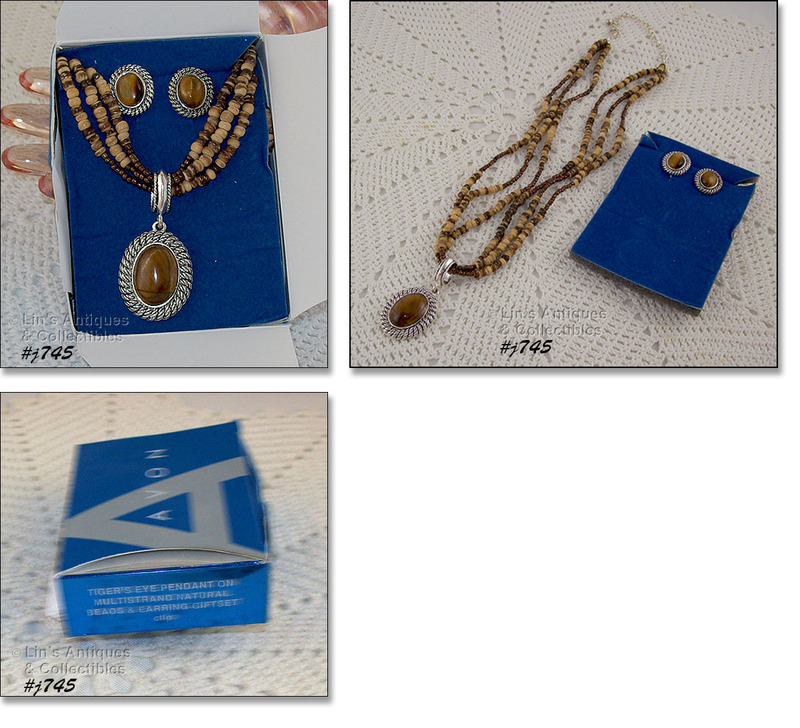 THIS IS A VERY PRETTY AVON PENDANT AND EARRINGS SET STILL IN THE ORIGINAL BOX! PER BOX: “TIGER’S EYE PENDANT ON MULTI STRAND NATURAL BEADS AND EARRINGS GIFT SET”. 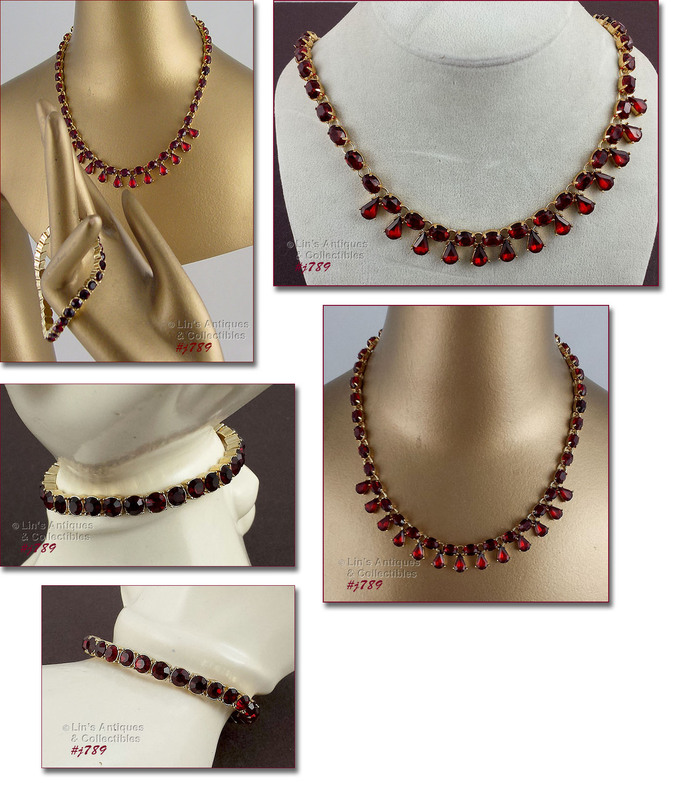 THE NECKLACE HAS ADJUSTABLE LENGTH AND MEASURES 19” FULLY EXTENDED. THE PENDANT IS 1 ¾” IN LENGTH (INCLUDING BALE). EARRINGS ARE CLIP STYLE AND MEASURE 5/8” X ½”. I THINK THE PENDANT HAS BEEN DROPPED RESULTING IN A HORIZONTAL BREAK ACROSS THE LOWER PART OF THE TIGER EYE. IT CAN BE FELT WITH A FINGERNAIL. THIS IS STILL A LOVELY SET BUT IS NOT PERFECT AND IS PRICED ACCORDINGLY. 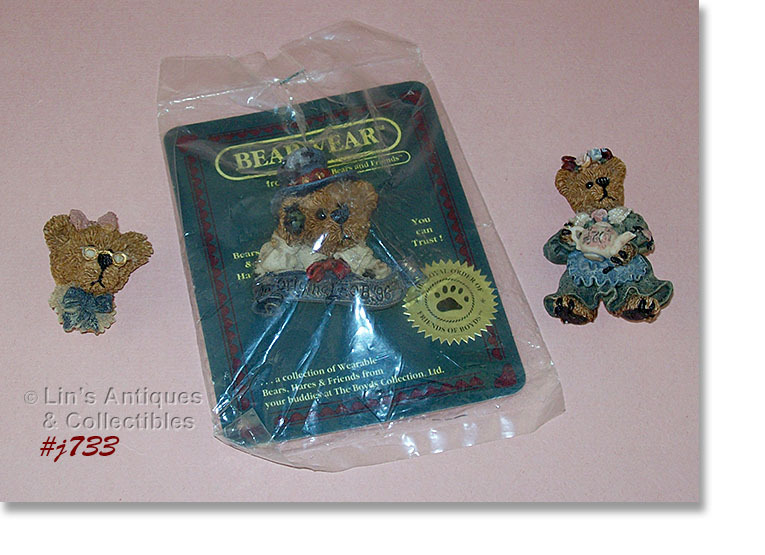 THIS LISTING HAS 3 BOYDS BEARWEAR PINS! ONE IS STILL ON THE ORIGINAL CARD WITH COPYRIGHT DATE OF 1995. THE OTHER 2 DO NOT HAVE ANY PACKAGING SO I DON’T KNOW THEIR COPYRIGHT DATE BUT I WOULD SURMISE THEY’RE APPROXIMATE DATE OF 1995. 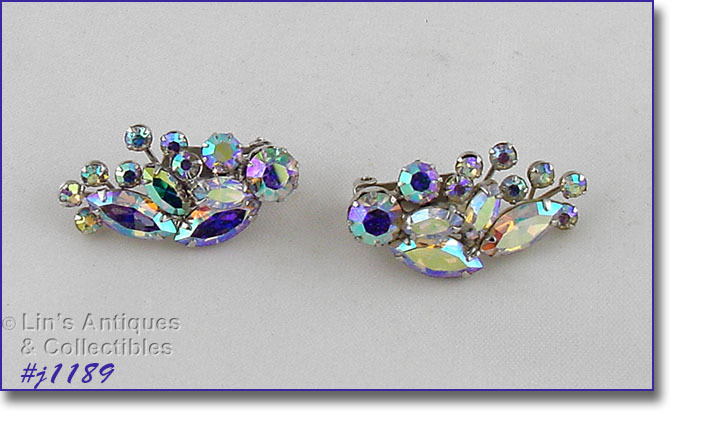 BEAUTIFUL BLUE RHINESTONES IN THESE VINTAGE CLIP BACK STYLE EARRINGS BY LEDO! THEY MEASURE 1” DIAMETER AND ARE IN EXCELLENT CONDITION. 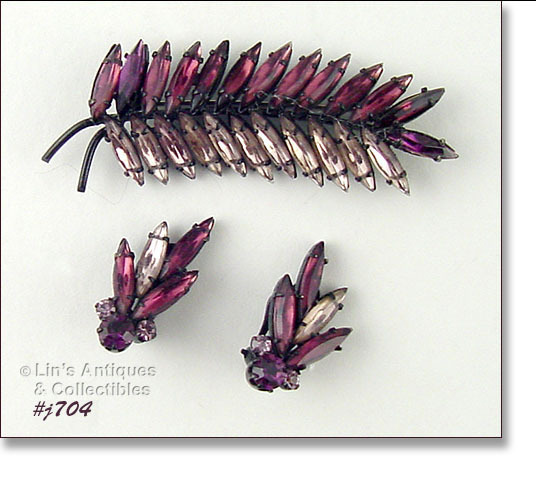 BEAUTIFUL VINTAGE PIN AND MATCHING EARRINGS IN 2 SHADES OF PURPLE! PIN MEASURES 2 ¾” LONG (AT LONGEST) AND 1” WIDE. 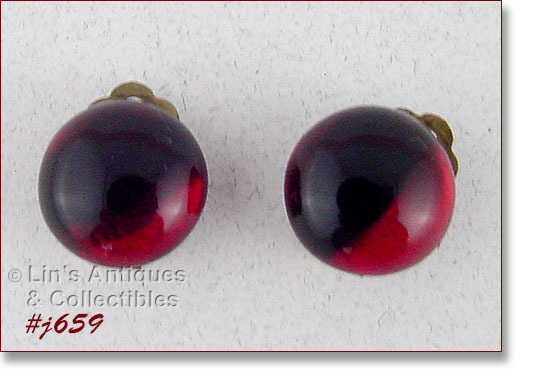 THE CLIP BACK EARRINGS MEASURE 1 1/8” LONG (AT LONGEST), 5/8” WIDE, AND ARE MARKED AUSTRIA. GORGEOUS! VERY PRETTY EISENBERG ICE PIN AND EARRINGS SET! PIN MEASURES 1 5/8” DIAMETER, THE EARRINGS ARE CLIP-BACK AND MEASURE ¾” X ¾”. ALL PIECES ARE MARKED EISENBERG ICE AND RHINESTONES ARE PRONG-SET AND SOME ARE PASTE-SET. ANOTHER GORGEOUS EISENBERG ICE STAR SHAPED PIN! THIS ONE IS GOLD-TONED WITH JET, CRYSTAL, AND BLACK RHINESTONES. PIN MEASURES 1 ¾” DIAMETER AND IS MARKED EISENBERG ICE. 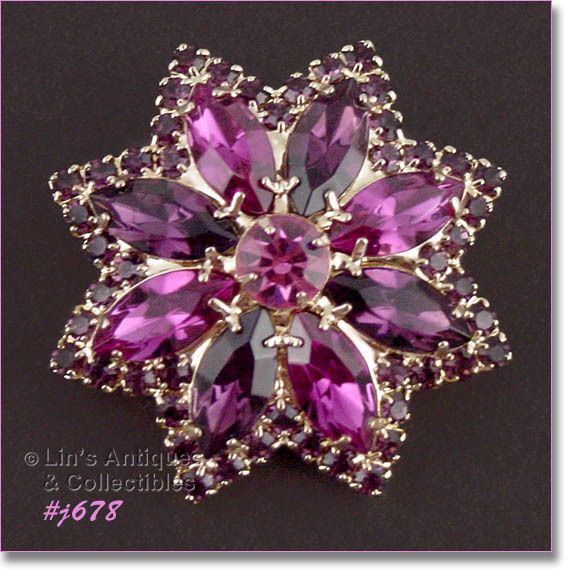 LOVELY COLORS ON THIS EISENBERG ICE STAR SHAPED PIN – ROSE, AMETHYST, AND FUCHSIA RHINESTONES! PIN MEASURES 1 ¾” DIAMETER AND IS MARKED EISENBERG ICE. THIS ITEM IS NOT SIGNED BUT IT IS STILL IN THE ORIGINAL ANSON BOX! 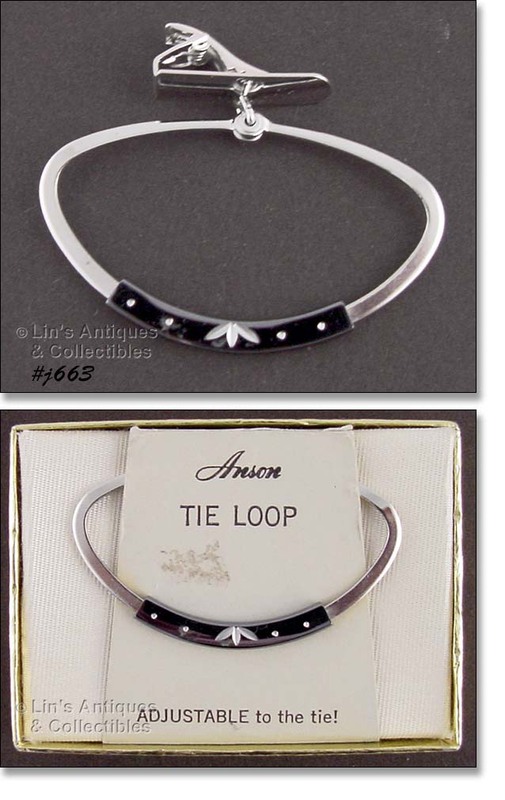 THIS IS A TIE LOOP AND PER PACKAGING IT IS “ADJUSTABLE TO THE TIE!”. NEAT ITEM. THESE GLASS EARRINGS ARE BEAUTIFUL! THEY MEASURE 5/8” DIAMETER, ARE CLIP STYLE, AND ARE MARKED W. GERMANY. THIS LISTING HAS AN AQUARIUS PENDANT BY RAZZA! THE CHAIN MEASURES 20”, THE PENDANT IS 3 ¾” X 2 1/8”, AND IS MARKED RAZZA. JEWELRY MADE BY RAZZA IS HIGHLY COLLECTIBLE. THESE NEAT CAT SHAPED EARRINGS ARE MARKED “LAUREL BURCH”! THE CATS MEASURE 1 1/8” X ½” AND ARE GOLD-TONE METAL. CUTE! THE LISTING HAS A DIABETIC MEDICAL ALERT BRACELET! MADE BY SPIDEL, BRACELET IS 7” IN LENGTH, GOLD-TONE METAL, AND HAS A SMALL DIAMOND ACCENT (DIAMOND HAS BEEN TESTED AND IS AUTHENTIC). 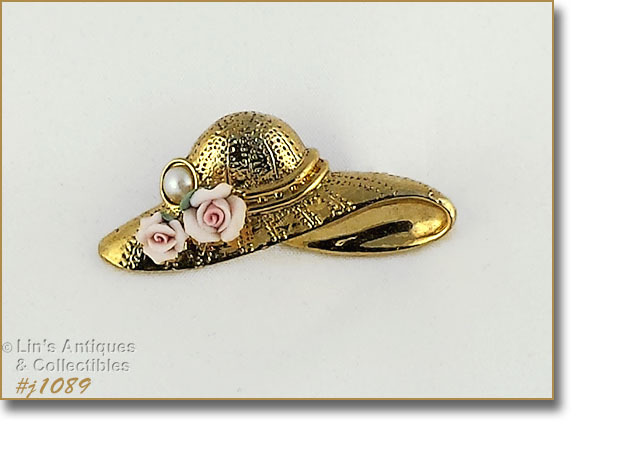 THIS LITTLE PIN IS SO PRETTY WITH LOTS OF DETAIL! 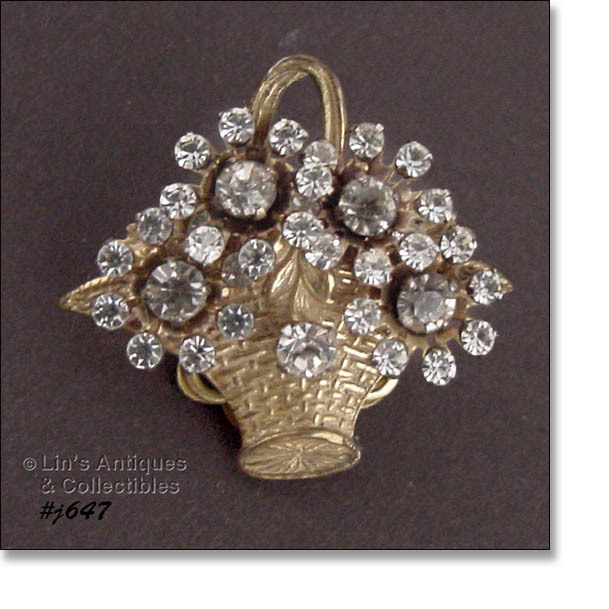 IT’S A GOLD-TONE METAL “BASKET” THAT’S FILLED WITH PRONG-SET CLEAR RHINESTONE “FLOWERS”. PIN MEASURES 1 ¼” WIDE (AT WIDEST, 1 3/16” LONG (AT LONGEST), AND BACK IS MARKED MIRIAM HASKELL. BEAUTIFUL PIN! 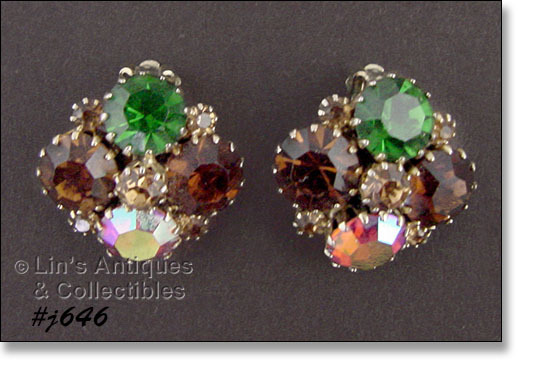 THIS LISTING HAS WEISS EARRINGS WITH BEAUTIFUL PRONG-SET FALL COLOR RHINESTONES! EARRINGS MEASURE 1 1/16” X 1 1/16”, ARE MARKED WEISS, AND ARE CLIP STYLE. GORGEOUS! THIS IS SUCH A PRETTY NECKLACE! THE CHAIN AND LOCKET ARE GOLD TONE, THE CHAIN IS ACCENTED WITH FAUX CRYSTAL BEADS AND THE LOCKET HAS A LOVELY ROSEBUD AND AURORA BOREALIS RHINESTONES FOR SPARKLE. CHAIN IS 24” AND THE LOCKET MEASURES 1 1/8” X ¾” (CLOSED). EXCELLENT CONDITION! THIS LISTING HAS A LOVELY HAR PIN WITH MATCHING EARRINGS! PIN MEASURES 2 ¼” X 1 ½”, EARRINGS MEASURE 1” X 5/8” AND ALL 3 PIECES ARE STAMPED HAR. VERY PRETTY! FROM MY COLLECTION, THIS IS A HATTIE CARNEGIE PIN! IT’S SHAPED LIKE A BRIDAL BOUQUET OF FLOWERS. MEASURES 2 1/8” LONG (AT LONGEST), 1 ¾” WIDE (AT WIDEST) AND BACK IS STAMPED HATTIE CARNEGIE ON AN OVAL SHAPED DISC. BROOCH IS IN VERY GOOD CONDITION WITH SOME VERY MINOR WHITE COLOR WEAR AND THE PINK ENAMEL IS MISSING ON TWO FLOWER PETALS. THE BOUQUET “STEMS” HAVE LONG AND SHORT STEMS – THEY ARE NOT BROKEN LONG STEMS. 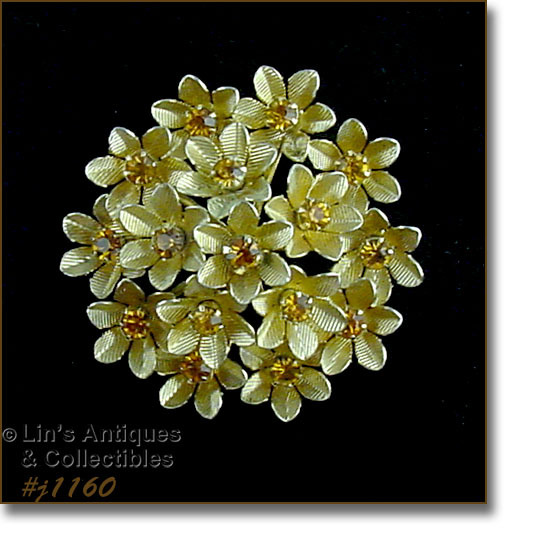 THIS IS A BEAUTIFUL VINTAGE PIN – VERY DIFFICULT TO FIND – AND A TREASURED ADDITION TO ANY COLLECTION! THIS LOVELY PIN WAS A GIFT I RECEIVED MANY YEARS AGO. EVEN THOUGH THE PIN IS UNSIGNED, I HAVE LISTED IT IN THE SIGNED CATEGORY AT OUR WEBSITE BECAUSE IT IS STILL ON THE ORIGINAL HANG CARD. THE PIN MEASURES 1 ¼” DIAMETER AND IS IN EXCELLENT CONDITION! THIS LISTING HAS A REALLY CUTE KIRK’S FOLLY CHARM BRACELET – IT’S A PERFECT GIFT FOR A NEW OR EXPECTANT NEW MOM! GOLD TONE BRACELET MEASURES 7 ½” LONG (END TO END) AND HAS 12 CHARMS – 4 ALPHABET BLOCKS, A DIAPER PIN, A SMALL MONEY BAG, 2 LARGE MONEY BAGS, 2 DOLLAR SIGNS, AND 2 BABY SHOES. EXCELLENT CONDITION IN THE ORIGINAL BOX! 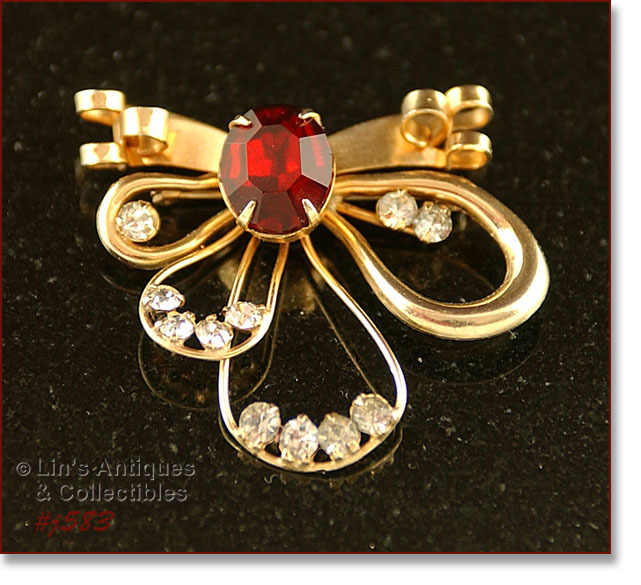 ABSOLUTELY BEAUTIFUL PIN WITH MATCHING EARRINGS PRODUCED BY B. DAVID AND STILL IN THE ORIGINAL BOX! SET WITH AURORA BOREALIS RHINESTONES, THE CIRCLE PIN MEASURES 1 ¼” DIAMETER, EARRINGS MEASURE 1 1/8” (AT LONGEST) AND 3/8” WIDE (AT WIDEST). ALL ARE MARKED B. DAVID AND APPEAR TO HAVE NEVER BEEN WORN. 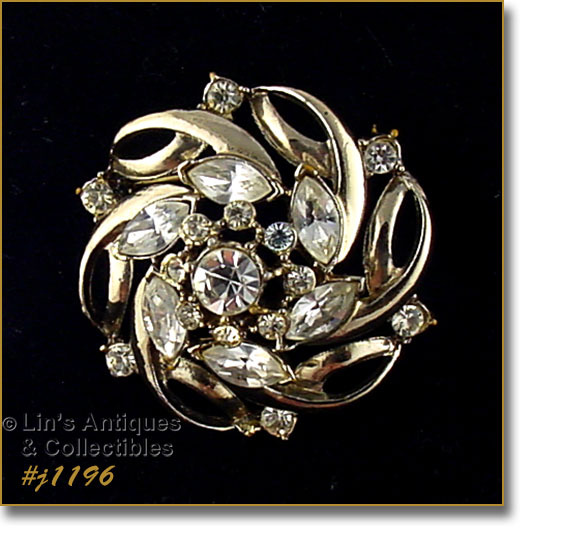 WHAT A SUPER GIFT FOR A VINTAGE JEWELRY COLLECTOR OR TO ADD TO YOUR OWN COLLECTION!! THIS IS A CUTIE – A KING LION PIN! BACK IS MARKED POLCINI, MEASURES 2”, AND IS IN EXCELLENT CONDITION. POLCINI ITEMS ARE BECOMING MORE AND MORE DIFFICULT TO FIND. THIS COLORFUL PIN HAS DIFFICULT TO FIND ORANGE COLOR RHINESTONES! THE COLOR IS BRIGHT AND DIFFICULT TO PHOTOGRAPH – ALTHOUGH THEY APPEAR TO BE REDDISH/ORANGE IN PHOTO, THEY ARE A TRUE BRIGHT ORANGE COLOR. PIN MEASURES 2 ½” DIAMETER AND IS MARKED JUDY LEE. IT IS FROM MY PERSONAL JEWELRY COLLECTION – YOU’LL LOVE THIS PIN! IT IS UNUSUAL AND IS VERY EYE-CATCHING! 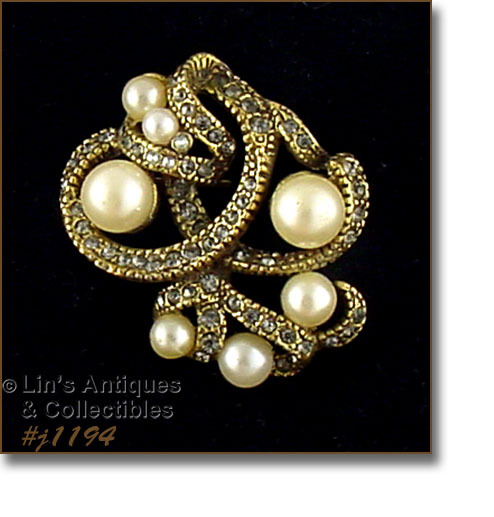 THIS LOVELY PIN HAS BEEN A PART OF MY VINTAGE JEWELRY COLLECTION FOR MANY YEARS! IT MEASURES 1 ¾” DIAMETER AND BACK IS MARKED MIRIAM HASKELL. SUPER! THIS IS A VERY PRETTY PIN MARKED SCITARELLI! 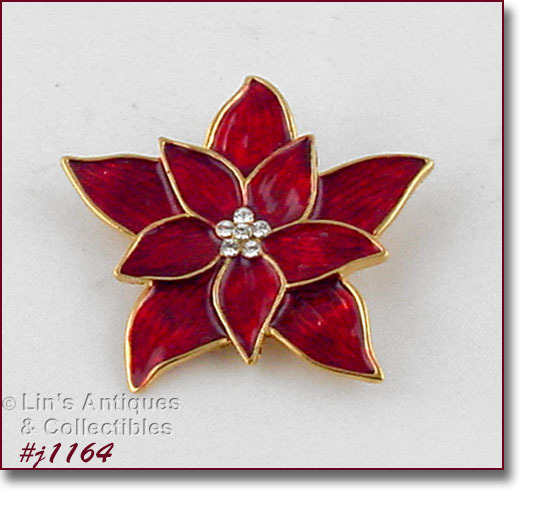 PIN IS GOLD COLOR METAL (NOT MARKED BUT MAY HAVE SOME GOLD CONTENT), THE FOCAL POINT IS A LARGE RED RHINESTONE AND IS ACCENTED WITH CLEAR FACETTED RHINESTONES. 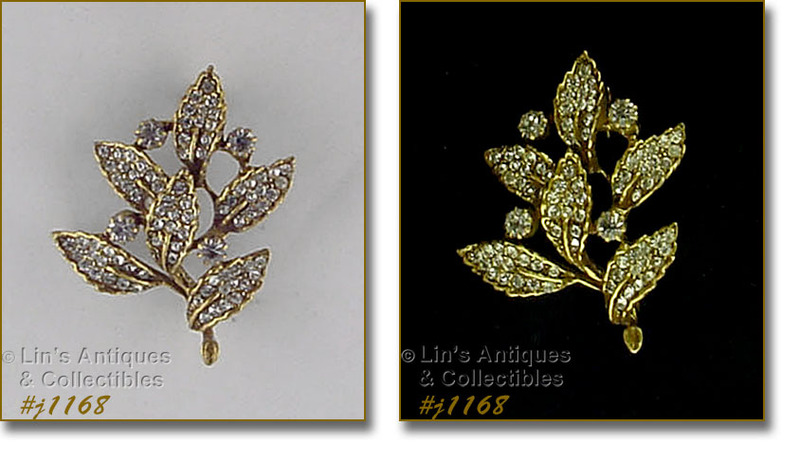 ALL RHINESTONES ARE PRONG SET AND PIN IS IN EXCELLENT CONDITION – SUPER ADDITION TO A JEWELRY COLLECTION! 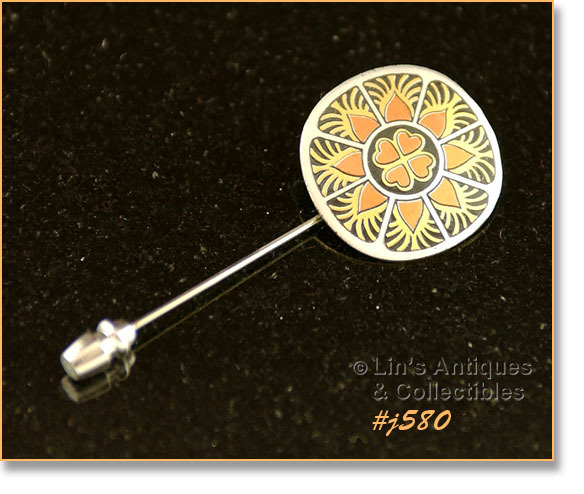 PRETTY DAMASCENE STICKPIN IN THIS LISTING! PIN IS MARKED REED AND BARTON DAMASCENE AND IT’S STILL IN THE ORIGINAL BOX. PIN MEASURES 2 1/8” LONG AND IS IN EXCELLENT CONDITION!